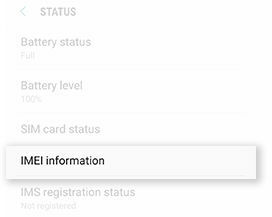 Galaxy S8+: How do I locate the IMEI Number on my Samsung Galaxy S8+ (SM-G955W)? IMEI (International Mobile Equipment Identity) is a unique 15-digit serial number given to every mobile phone which can then be used to check information such as the phone's country of origin, the manufacturer and its model number. 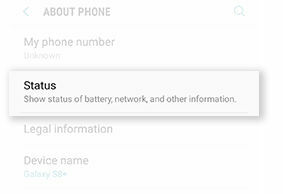 You can find your device's IMEI number and serial number in Settings. 3. Swipe to and touch About phone. 5. The Serial number will be displayed on the screen. To view your IMEI number, touch IMEI information. • The Packaging: The original box should list the phone's full IMEI and Serial Number. • Your Carrier's Website: Your account details may list the phone's IMEI and Serial Number. • Google: If you have a Google account, visit Google Dashboard and view your Android Devices. • Bill of Sale: Review your sales receipt or contract for your phone's IMEI and Serial Number. Or go back to the store. • Samsung+: If you have a Samsung account and Samsung+ app installed on your phone, the Serial number stored in Samsung+ is actually your phone's IMEI number. • Dial ⋇#06# on the phone: It will display the IMEI and Serial Number. This only works when supported by your carrier.